Another week and the last of the summer holidays. Back to preschool next week. Not sure how I am feeling about this. Yes it has been stressful but I love having them both at home. I kick started the week with it being my birthday. What better way to start a week! So Saturday was my birthday, I was woken up with cake and singing - what more could a mummy want! We then enjoyed a lovely lunch and play at the new Brewers Fayre soft play, we were joined by my Mum and Nan. Then the hubby and I enjoyed a few hours at the pub having a quiet drink while Mum took the boys food shopping. Then the evening was full of laughs, drink and food with our best friends. My friend got me my favourite flowers which are still brightening up our kitchen. Sunday was a day full of parties. No photos here as it was a manic day but we started it off with Finley enjoying soft play for his pre school friends birthday. We then travelled down to see family in Bournemouth and to celebrate our nieces birthday. It was so lovely to have all the family together and to see all the kids playing. Monday I was treated to lunch made by my friends husband, as she was working and we had a viewing. Monday was a nice chill out day after such a hectic weekend. On Tuesday I think I lost my mind and took the boys to the new soft play we had gone to on Saturday. It was manic and way too busy. I think we are going to try it out again once the schools are back. 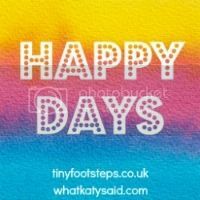 Wednesday we enjoyed a shopping trip with my sister in law for some much needed trousers for Finley. He seems to have had a growth spurt and all his trousers are too short! On Thursday we popped into town. We walked and then bussed it back again. We met a fellow local blogger in the park, which was lovely to talk blog with someone who talks our language. We unfortunately got caught in the rain but the boys thought it was so funny! To end the week we enjoyed a trip to westonbirt with some friends. It again was such a lovely day with lots of giggles. Noah decided to jump in the biggest muddy puddle he could find, we dressed up baby in my sunglasses and Finley did some tree climbing! I'm not too sure why but the photo of the doll wearing sunglasses freaked me out a bit! How lovely you got to chat to another blogger. I remember how excited I was when I bumped into a fellow local blogger (I thought I was the only one from my town) on a train. It's nice to chat to someone who 'gets it'. Looks like a great fun and busy week! Glad you had a lovely time for your birthday! 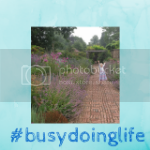 Thankyou so much for lining up with #busydoinglife hope you can join me again tomorrow? !